when I go to visit a stitching friend. In the meantime, I noticed a green project bag that I knew contained some pieces of my late mother's needlepoint. I took a look and found two iris pieces that I knew she bought at my shop because I remember buying them from the sales rep. She had always liked pansies and violets, but these were truly beautiful pieces that I know she couldn't resist when I got to convincing her that she had to have them. The first one she had started . . . and then the yarn got separated from its project (thus motivating my plaintive plea in my last post to please, stitchers and knitters, please label your projects or provide a list of your colors, or at the very least, make sure everything is together in one bag. It makes going through your beloved projects so much more in keeping with your own wishes for your beloved projects)! Apparently, Mom had started stitching this piece, notice the Q-Snap frame holding it in place, and so it was up to me to find matching colors. Did I mention that I still have some Persian Yarn in my storage unit?! guesswork to find the correct color of yarn she used. BTW, "Lee" is the name of the needlepoint designer/manufacturer. Lee's Needle Arts is a needlepoint company that had some beautiful needlepoint colors on their canvases that I always found luscious, and the canvases were also reasonably priced for hand-painted canvases. When I bought my shop, I wanted to bring in an alternative to the types of needlepoint my predecessor had always carried. So this was one of my new offerings to a whole new slew of customers, including my mother. And on this picture is where my background color ran out. Really, I'm quite proud of the progress on my background - there were a lot of places to fill in and join in a continuous, smooth angle. The background is stitched in a basketweave pattern, so called because the back of it looks like a woven basket. Literally. While it takes more yarn to complete and will help keep a monoweave canvas straight (with mono canvas, the individual strands are woven over and under one another, rather than through one another like an interlock or Penelope canvas), it also takes some "reading" of the canvas to know whether you should stitch up the angle or down it. If you get your stitching direction wrong, then it will show uneven-ness on the front, and the back will have two straight up-and-up rows instead of an up row and a sideways, woven row. But I geek out. While NNW does not have the background color in stock, and the single importer and dye-er of said color has been in product backorder for almost two years on all of their Persian yarn, I think maybe, just maybe, I have found two little skeins that I can use to complete this project, finally. Then those completion endorphins can kick in and I can begin another project! But wait, I already have started another project! fade into a supporting role against these strong purples tones. Like I said, Mom had simply put the colors and the canvas (folded! oh noooo!) into a gallon-sized Ziploc bag and not even begun it. Which, if I die tomorrow, will be the case for me with some projects, I admit, but I hope to have many, many more good years of stitching. With this particular piece, I'm using longer "pulls" of yarn from the Persian than I normally do, in part because I am discovering as I stitch just how long a piece goes before I have to start another piece. The yarn is a good quality yarn, and it does not fray towards the end of the stitching. On the other hand, I can't use as much of the skeins of DMC yarn on my pull, as it is a single strand and is more loosely twisted than the individual strands of Persian. And again, I am stitching background (using tent stitch this time, as there are really no large stretches of background that would warrant using the basketweave) as I go, so that I don't stitch all the pretty parts and leave the dull, boring background to do. Someday. That's one of the advantages of working on a frame, too - you do a section, then you roll it to the next section, and just move on up the piece until you are done, pattern and background and all. So that's it for this post. I will definitely show some progress on the second of the two iris pieces, and perhaps my background color will arrive in the next week or so. Which will leave the question, which do I stitch first?? That sounds so very Victorian, doesn't it? I just finished typing up some passages from Hard Times by Charles Dickens and Nightingales by Gillian Gill (the latter a biography of the Nightingale family and how it all led to Florence Nightingale's extraordinary life) and these Victorian thoughts just tickle their way into my creative writing day today. Obviously, I wrote my last entry over the Thanksgiving weekend, a weekend I spent enjoying my last few weeks with my large, round, grey cat. I had received word in mid-November that her enlarged heart had now morphed into heart failure proper (cardio myopathy), and all of the months of medicating her with Plavix (yes, you read that right), Atenatol (to slow down her rapidly beating heart) and Methemazol (to control her hyperthyroidism) were going to come to an end. And she was an incredibly good patient - she did not try to claw your pill-holding hand out of her mouth, she just did everything she could to walk away from whatever you had popped into her mouth as quickly as she could, and there were times when I found little bits of pill in different places in the house. I was relieved that, if she had to become so ill, it was during a time when I had the monetary funds to buy all this medication for her (Plavix!! Jeez!). Strangely enough, I felt myself hearken back to my Quaker college days and "bear witness" to the uses of modern medications for one's feline off-spring. The last time I went to the pharmacist, there was a woman buying meds for her dog, so I didn't feel so out of place. Still, that's a lot of stress for a cat and her owner to go through with all those meds and schedules. While I had had a year to prepare myself that animal companions don't live as long as we do (it was in early December last year when I noticed that her heart was beating like a rapid snare drum; she was lying on my pillow with her heart close to my ear), I still broke down in two vets' offices while I dealt with the inevitability that her long life was coming to an end. a play toy thing, but she loooved to sleep on it. And fortunately, the weather over Thanksgiving was warm, too, relatively speaking. So we were able to trundle along outside to soak up some rays. I experienced a sort of peace during that weekend - there was the loneliness of being by myself partnered with the joy of buying food that I would cook only for myself (such as Rock Cornish Game Hen). There was the quiet solitude of spending most days listening to a book on tape (on this weekend, the above-mentioned Hard Times with an extraordinary narrator) and doing my Christmas knitting partnered with some time on Thanksgiving evening with my eldest niece and our next-door neighbors, sitting and talking. And there was the otherwise-cold bed with one cat against my belly and the other against my back, doing everything they could to help keep me (and themselves) warm. So while Webmaster Bill went up to see a large houseful of relatives of 3 consecutive generations, I knitted children's sweaters and a scarf and more sweaters. Guess who wanted her picture taken while I was at it?? She's at peace, now, on the other side of the Rainbow Bridge, that wonderful place where we get to meet all of our dear, departed furry and fuzzy and feathered friends that have joined their lives with ours. Rest well, dear kitty, and someday you will sleep on my head again. The cool thing was that once you make and decrease the ears, they stick out the side, and while it's drying you can make them kind of curve to resemble Yoda's ears themselves. Trying the hat on the cat was great fun, and made possible by the use of an abundance of kitty treats. Then there were the sweaters for little ones. I'm beginning to "get" the fun of knitting kids' sweaters - they're quick, they can be really cute, and as long as you get the gauge to almost size, it doesn't matter if they're a little too big - the child will grow into them! has become infatuated with "bunnies"
There is a sweater that I can't upload here, as the recipient has not received it yet due to too busy schedules during the Christmas season. All I can say is . . . the buttons really set it off! And then, of course, there was Christmas, then all the many days off in between (fortunately I'm working for a company that recognizes the wisdom of closing the office when most everyone is going to be on vacation, anyway), including finally reading The Millenium Trilogy by Stieg Larrsson (yes, it really is that good) and watching a ton of movies. For all of you who know me, I mean, really, really know me, I will confess here: I bought a ticket to the 3-D showing of Tin-Tin. Why? Well, for the same reason that I saw 13 Days in the movie theaters a decade ago: it's the movie where they show the preview of The Hobbit. All I can say about the preview is WOW. I can't wait. I thought that the love and excitement had cooled off into a warm, nice glow, but no, not really. PJ and his group are going to do things with this interpretation of a mythical masterpiece the likes of which the world has never seen. I am so very, very glad that I live in a time where these masterpieces can come to life on a big screen. Really I am. By the way - Tin Tin is a really good movie. There were moments when I even forgot that I was watching an animated, motion-capture film. Definitely a boy's adventure: pirates, adventures, and intrigue. Now that all the Christmas knitting has ended and before I spend time at The Mountain, the time has come to put down the knitting and pick up . . . the needlepoint! Yes, I went rooting around in a closet, wondering what was in these packagesssss, and I found some of my mother's needlepoint. She had started one piece (but just barely), and there was no yarn to go with it so I went with my best guess on it. I'll take an aside here: if you do any sort of knitting, needlework, paper crafting, etc., please, please put all of your materials together, or at least put a list with your package of materials, colors, etc., or even just show your nearest and dearest what you are working on and what your intentions are for it. So anyway, on the one I've matched the yarns as near as possible, and with the recent supply problems with Persian yarn, I'm finished on it until I can find just one (or maybe two) more skeins of the background color. I've started a second, also one Mom bought at my shop, also Irises (she always waxed on about pansies, but seemed to have an affinity for irises in her NP) for which I will need a frame (of course, I have several, but it will involve going to get them and I'm a little lazy today), and the final . . . ah, now that is a story! 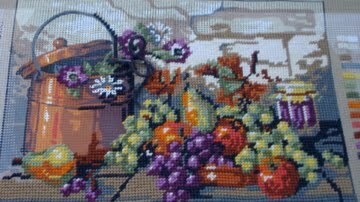 Several years back, maybe as many as 7, Mom received a gift of needlepoint from her sister-in-law, complete with sufficient thread to finish the design. The canvas was 18 count (18 sts to the inch, for all you knitters out there - canvas comes at 10 sts/in, 12/13/and 14 sts, and 18 sts to the inch, not to mention 40 sts to the inch - this latter is stitched on silk gauze and is very fine, very beautiful, and I'm not going to do it in this lifetime. Think dollhouse rug.) and Mom couldn't see it. Family dynamics being what they are/were, she asked me to do it for her. And asked, and argued, and demanded . . . and still it sat there, because, well, I had a shop to run and models to stitch and had no time for personal stitching anyway. When I began poking through the above-mentioned bag, I decided that it was time to begin stitching it (after I had finished the more traditional needlepoints) and to do so would require just the right kind of thread. And like many projects I'm looking forward to, I like to savor it. Contemplate it, think about it, work on an appetizer for a bit . . . until I can't stand the antici---pation any longer, and just pick it up and work on it feverishly with its beautiful colors. The hummingbirds are going to be silk, the leaves in combinations of cotton and wool, and the remaining background wool. It will be a delight. For right now, then, I please myself with a really cool deep-purples-and-blues irises in a kind of 2-D design (pictures coming soon!) using traditional wools. After all, I helped Mom pull these yarns, listened to her agree and argue, and if I liked those wools all those years ago, what's not to like now? The fancy stuff will take care of itself - this wintertime is all about quiet contemplation, enjoyment, carefully finishing what had been unfinished. Till next time, have a marvelous new year, and hug the ones you love. Include yourself in the hug!